After the unboxing post, I've been using the Zidoo X9 for a week daily and I was impressed with the device. There are already several good reviews for Zidoo X9 on the web so the following review will focus on features that were missed or were unavailable, at the time those reviews were published. Setting up the the Zidoo X9 is easy, Zidoo provides everything you need (except batteries for the remote) right in the box. First, we need to connect the power adapter, add the provided HDMI cable between the Zidoo X9 and the TV/monitor (note that Zidoo X9 has HDMI in and out, the HDMI out should be used), then set the on/off switch to on. The front LCD panel will light up and display the word "boot", replaced with "Hello" after a few seconds. Boot time is reasonable, below 30 seconds. 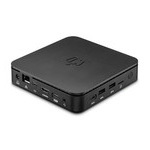 Zidoo mentions their ZIUI on the box and even on the mini PC itself so naturally I was curious as to what it is. 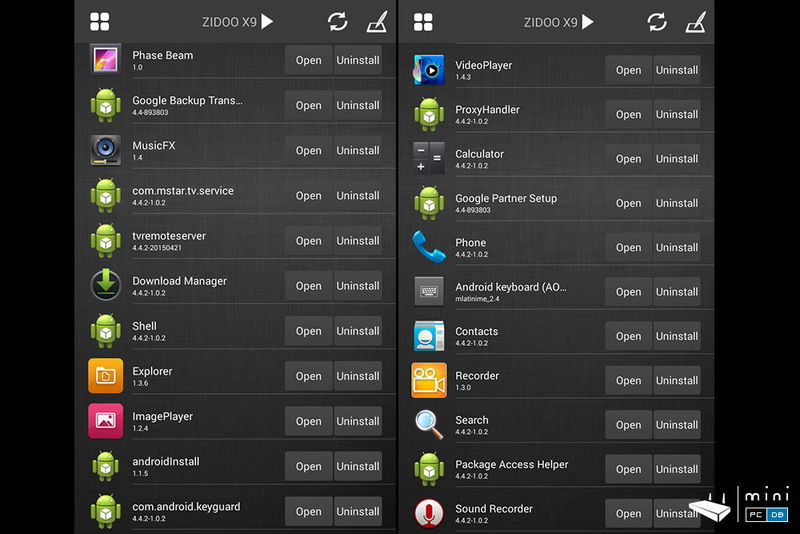 As it turns out, ZIUI is a custom launcher developed by Zidoo as remote-friendly as possible - and they did a good job. It's tile-based and each tile is color-coded so it's easier to remember. 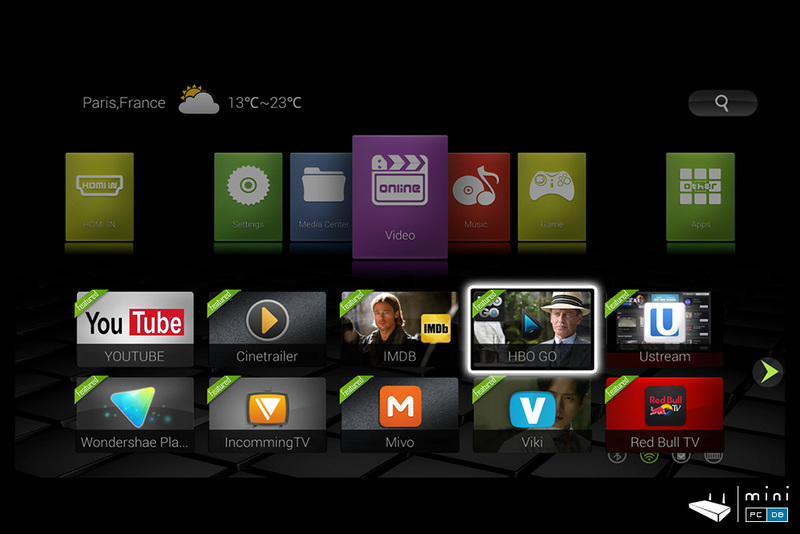 The tiles look good on big screens and the interface feels snappy. You can also quickly navigate to a specific app using the search button on the top right. 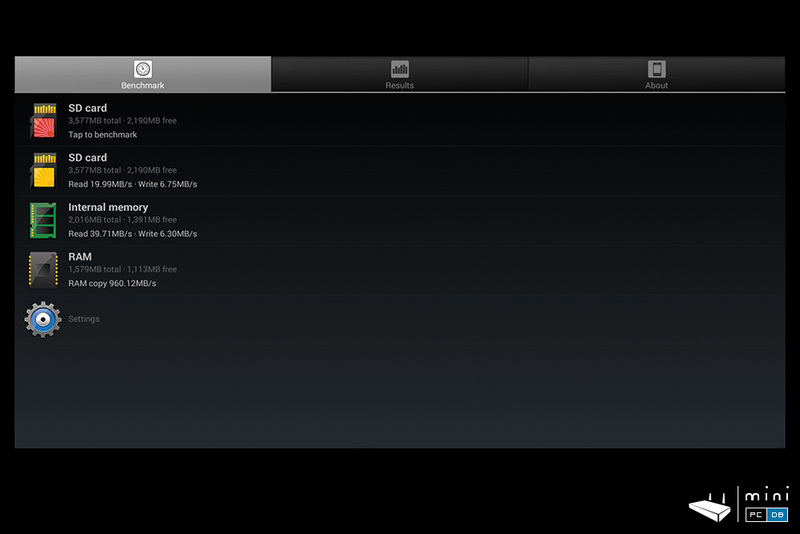 There are 4 icons on bottom right that show what services are currently active (BlueTooth, Wi-Fi, USB, HDMI-In). Top left displays wheather info. When you select one of the main options a second menu pops out with hand-picked apps related to that option (and you can select which app appears where). Although probably a single "Apps" tile with a submenu containing the other app-related sections would have sufficed, Zidoo did spend a good amount of time to improve the user experience and the results are showing. Customizing the ZIUI launcher can be done by changing the theme to one of the other themes found in Settings->Base Setting. 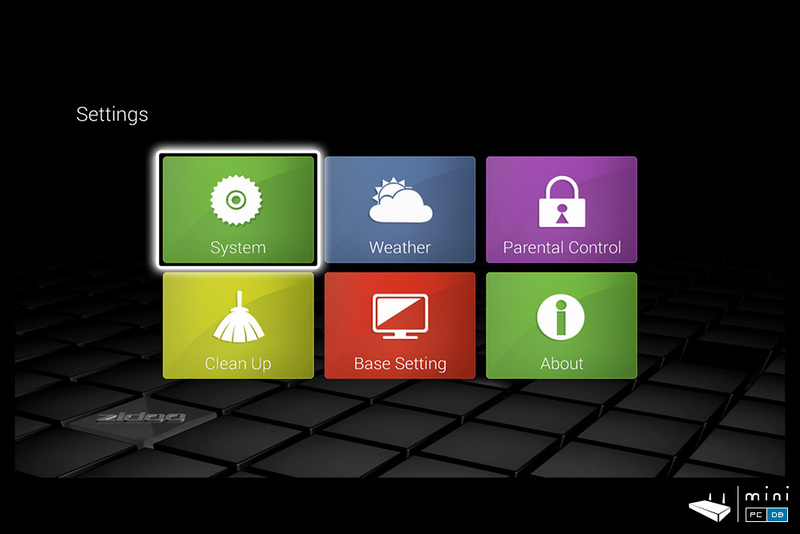 Zidoo even implemented some Parental Control features. 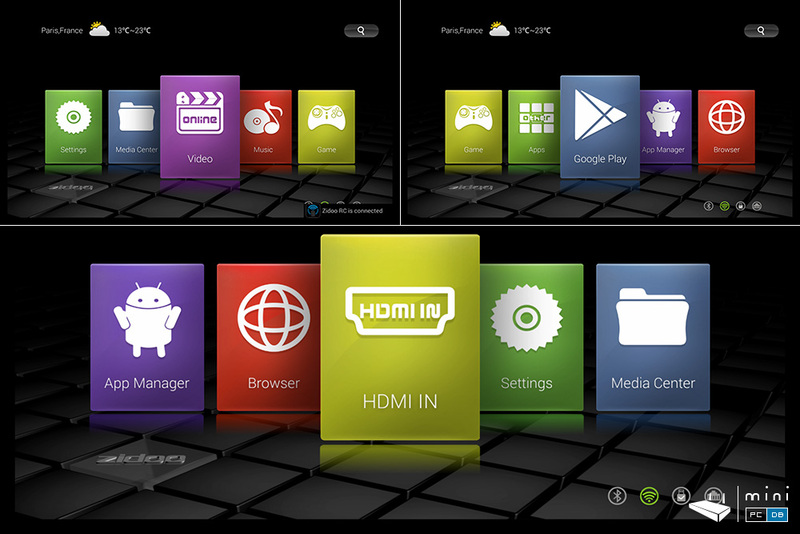 Conclusions on "Setting it up": installing it is a child's play and the custom ZIUI launcher makes the user experience enjoyable on big screens. 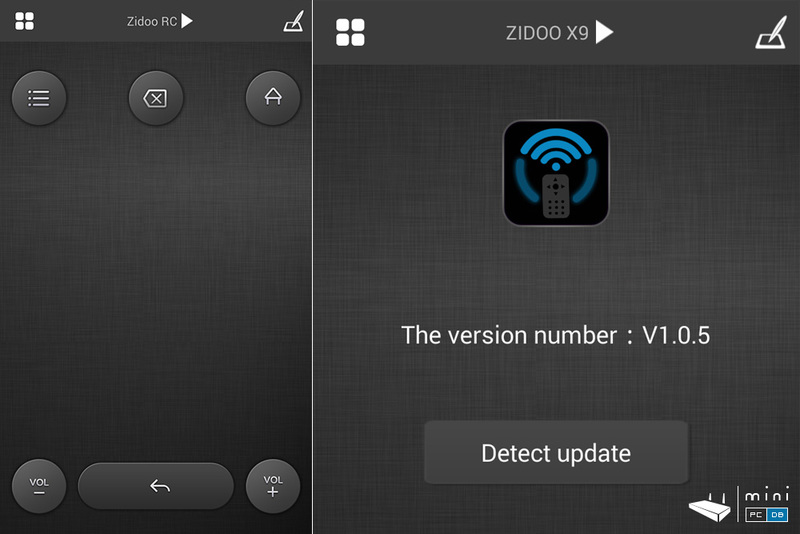 Zidoo X9 can be easily updated via OTA. 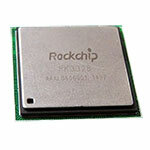 Some Android devices have complicated update procedures, with software installed on the PC. 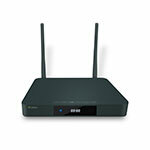 Zidoo has this covered very elegantly, over the air (OTA). You simply have to navigate to System > About > Update and choose OTA. 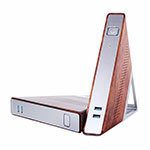 The mini PC will download the update and reboot itself to complete the update. Zidoo X9's infrared remote has a learning function, basically 4 reserved keys that you can use to learn any remote you already have (most likely the TV remote). The red shutdown button has two leds on it's sides, green led on left and red led on right. The red led is used for the learning process and when any of the 4 special keys gets pressed, while the green led lights up when you press one of the "regular" keys from the Zidoo remote. 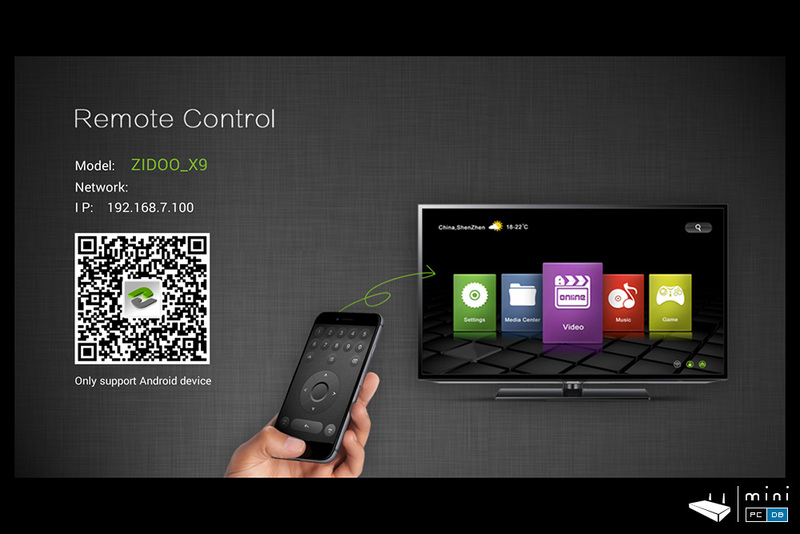 A rarely mentioned feature of the Zidoo X9 is the Zidoo RC app, which allows you to control your TV box from your Android tablet or smartphone. In order to install it, navigate on your Zidoo X9 to "App Management" tile, scroll down to the very last row and click on "Zidoo RC". You will be prompted to download the app from Zidoo.tv. There's also an "About" link, which is oddily not placed last on the left menu, and a "pen" icon that trihhers the input mode. In order to enter text using the phone's virtual keyboard I had to tap again on the input box, which was annoying at times, maybe this will be fixed in a future version (currently the Zidoo RC client is version 1.05, while Zidoo RC server appears to be version 1.0.8). 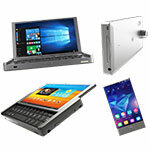 Of course, as with any other Android Mini PC you could use a keyboard, mouse or an airmouse like the Mele F10 Pro or apps like DroidMote. 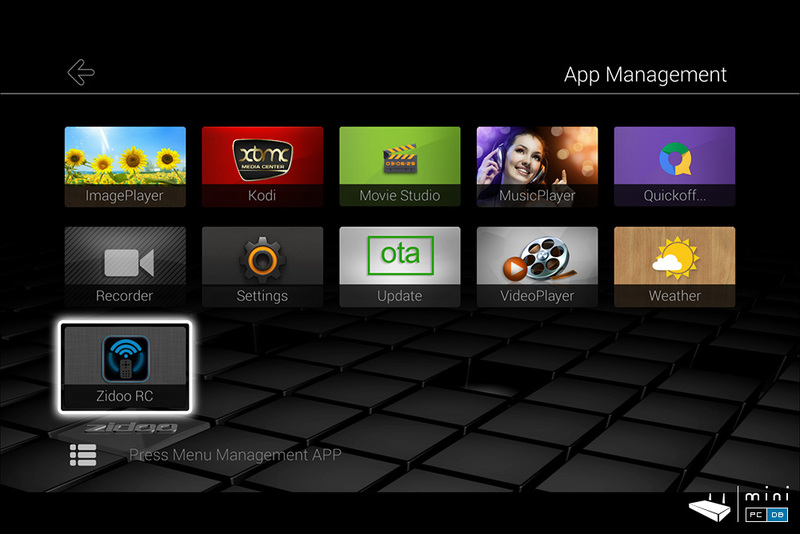 There are also remote control apps that are specifically designed for Kodi, like Kore, the official remote for Kodi. 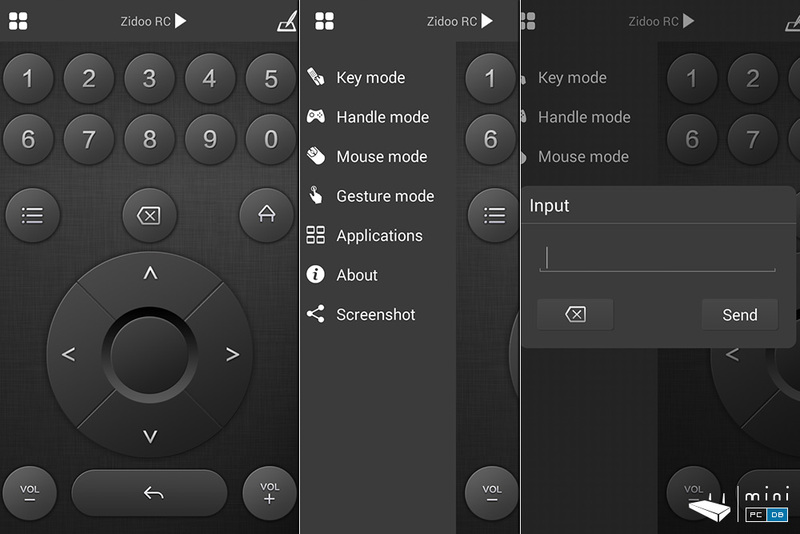 If your IR remote gets misplaced or stops working you will still be able to use the Zidoo X9, as you start it manually by switching it off, then on and after that just use the Zidoo RC. 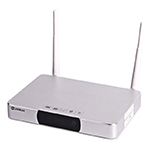 Conclusions on "Controlling your Zidoo X9 Mini PC": Zidoo provides an easy to use IR remote which is a perfect match for the tiles found on ZIUI. 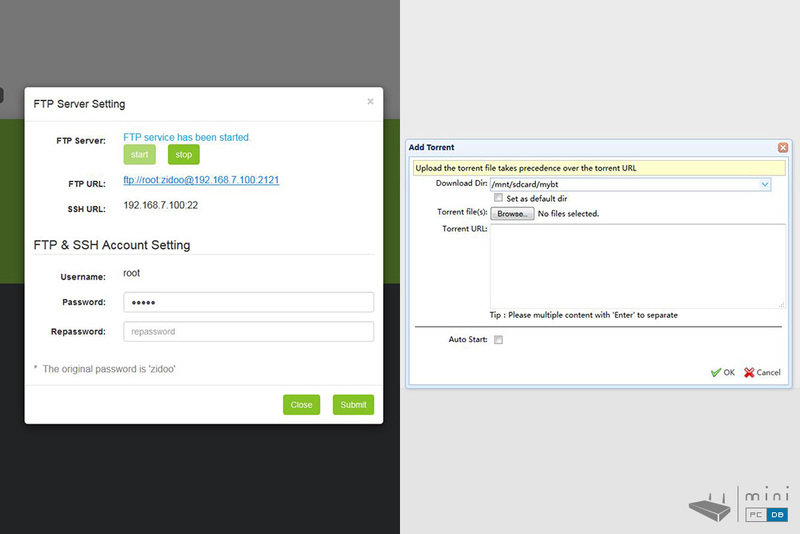 If you want better control you can use your existing (air)mouse or Zidoo RC. 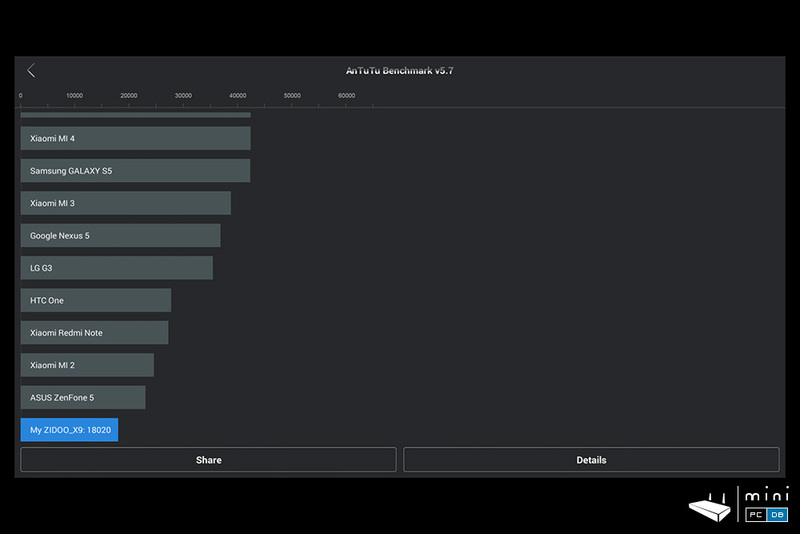 In an unexpected turn of events, Zidoo X9 performed better than expected on many of the benchmarks tests (based on the scores published by earlier reviewers) which means that Zidoo managed to get more juice from the SoC (or improved the hardware). 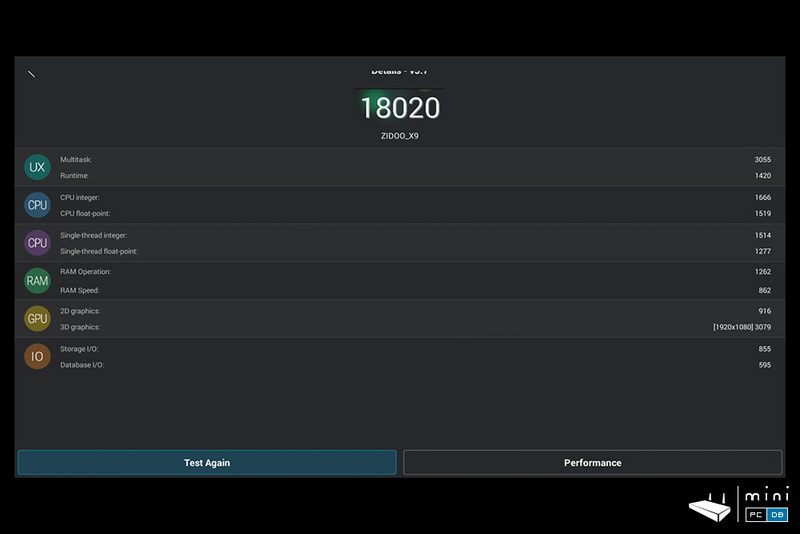 AnTuTu: Zidoo X9 with current firmware (1.0.30) performed better than on the original reviews, scoring just over 18.000 points (instead of just below 16.000 as it was before). 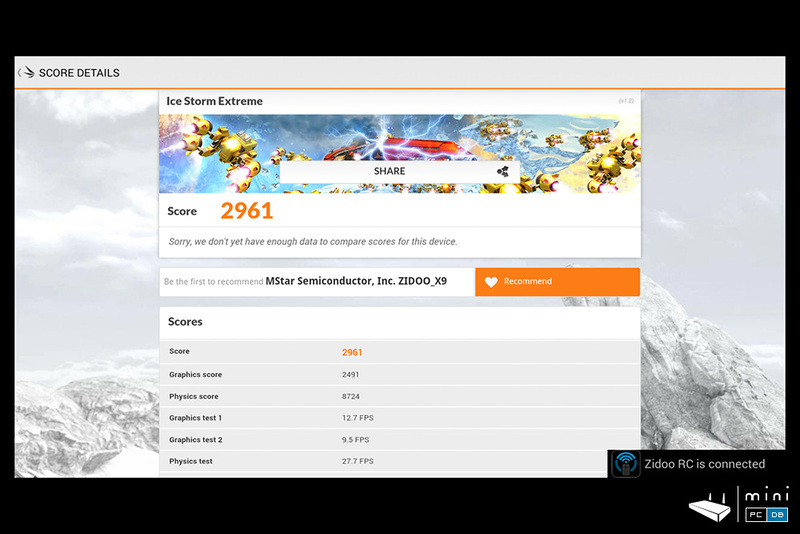 This is not impressive for those that seek raw power for gaming and whatnot, but a decent score for normal use. A1 SD Bench was used to test SD Card, internal storage and RAM. Results were quite good: ~20MB/s read and ~6.75MB/s write on SD Card, 39MB/s read and 6MB/s write on Internal memory and ~960MB/s RAM copy speed. 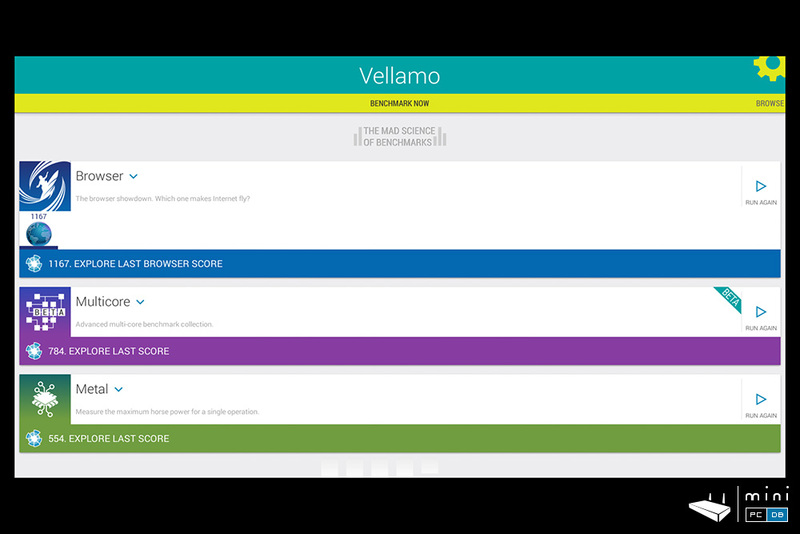 Vellamo results were 1167 for browser, 784 for Multicore (beta) and 554 for Metal. Ice Storm Extreme: a total score of 2961, with 2491 for graphics. The Zidoo RC has a "Game mode", there's a "Games" tile on the main menu, so Zidoo (the company) did put some efforts on this, but the SoC is just not powerful enough to run heavy games. I was able to play Beach Buggy Racing or Angry Birds normally, but for 3D or otherwise GPU intensive games you'll need a more powerful CPU/GPU (but they'll also be more expensive). 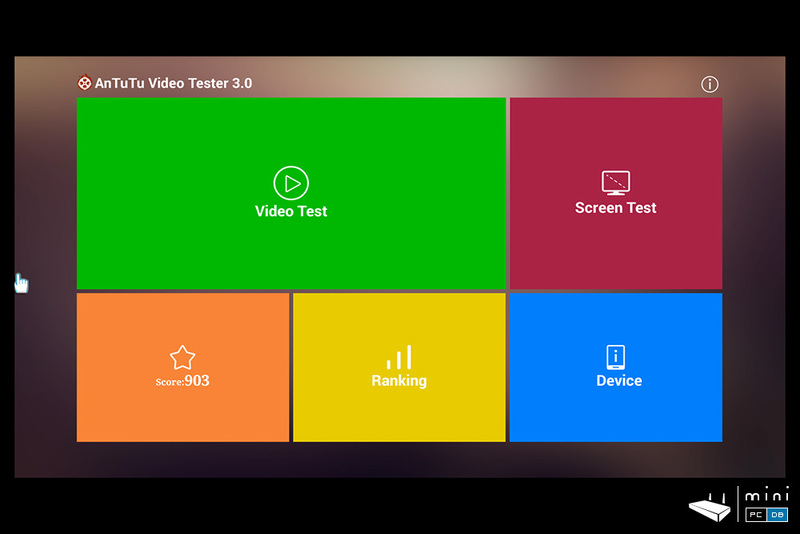 Antutu has a video tester that makes much easier the testing of an Android Mini PC's video and audio capabilities. Zidoo X9 did well on the test, with 26 items fully supported and only 4 partially supported and the final score was 870 on the first run and 903 on a second one, which is quite good. 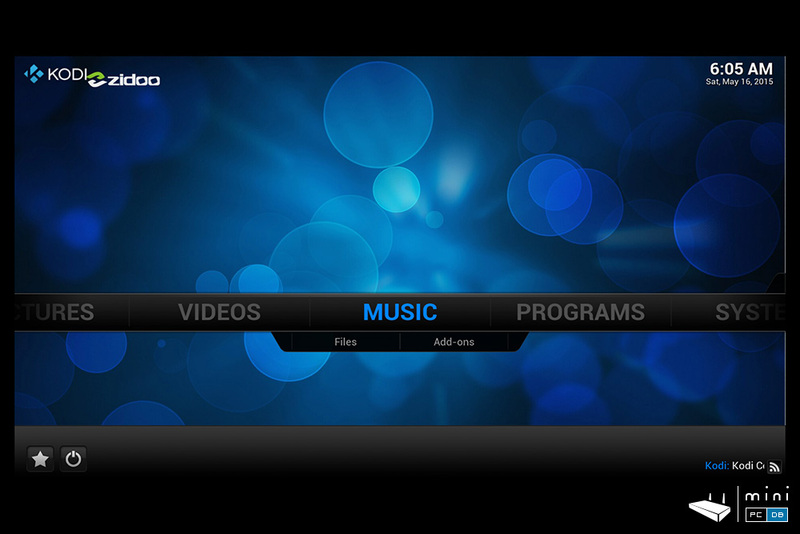 It's not a big surprise that Zidoo X9 comes with Kodi, a customized version. I had some problems adding a NAS share on Kodi via wi-fi, but once connected with ethernet everything worked smooth. I was able to play normally all sorts of videos. Playing common formats like TV series episode (1080P and 720P) or 1080P movie is done flawlessly. 4K videos rendering is mostly OK, but not perfect. 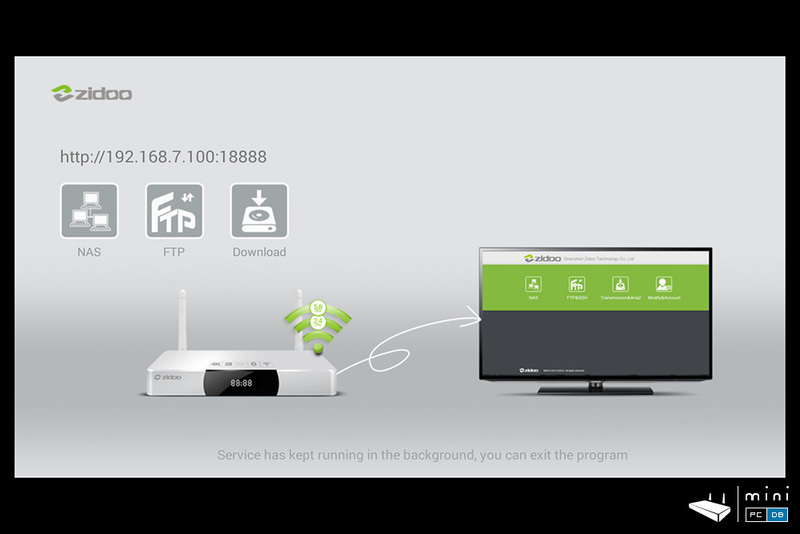 One of the improvements added by Zidoo after they launched the Zidoo X9 is the NAS Kit, which turns the Zidoo X9 into a true NAS, with FTP and Samba shares and Torrent downloader (Transmission). Installing it is quite easy: access the forum.zidoo.tv to get the latest version's download link (currently it was 1.0.7), download it on the X9, install and reboot. 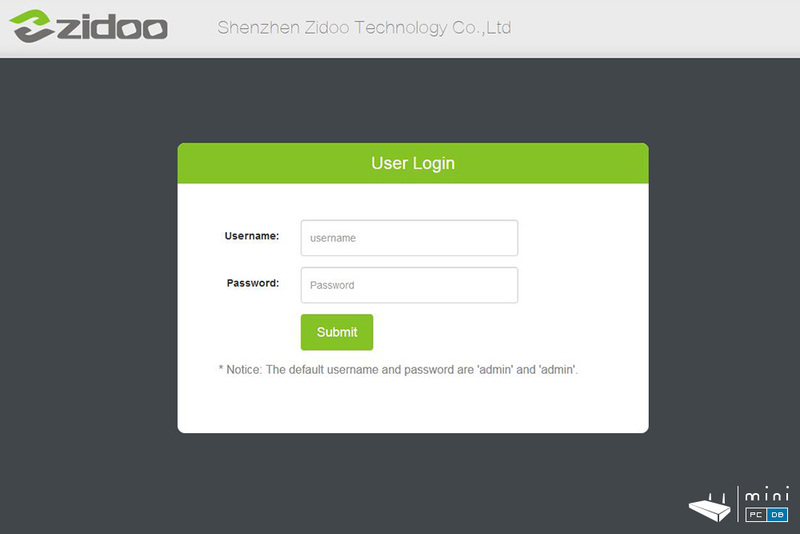 After the installation, I was able access the Zidoo X9 from my computer by typing the http://Zidoo_IP:18888 in the browser (default username and password are both "admin"). 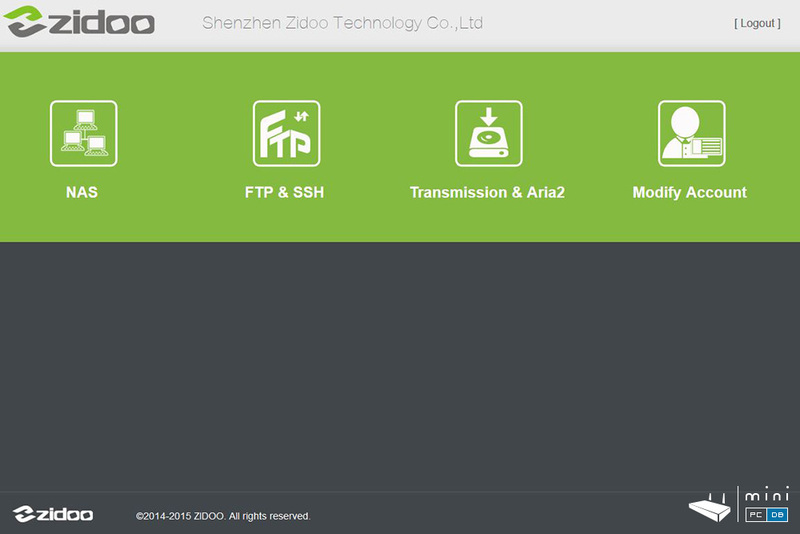 The interface is simple and, as expected with Zidoo, good looking. 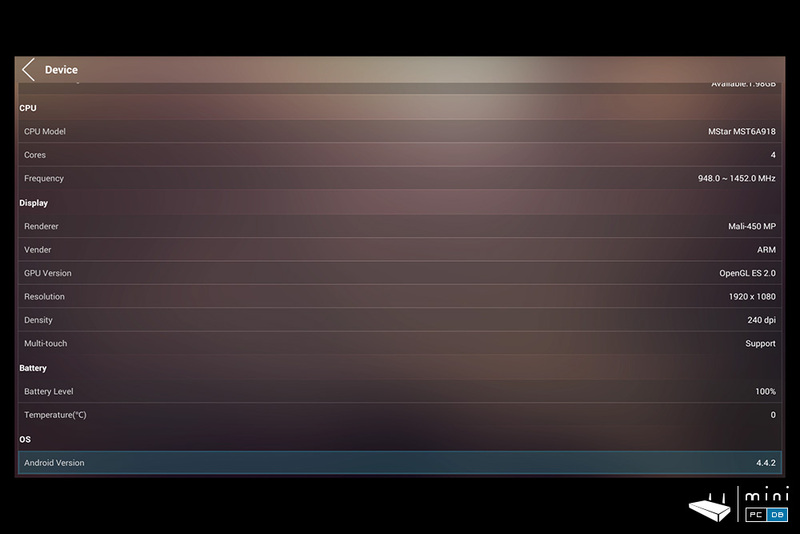 You can turn each feature on or off from here (by default, they all are on). 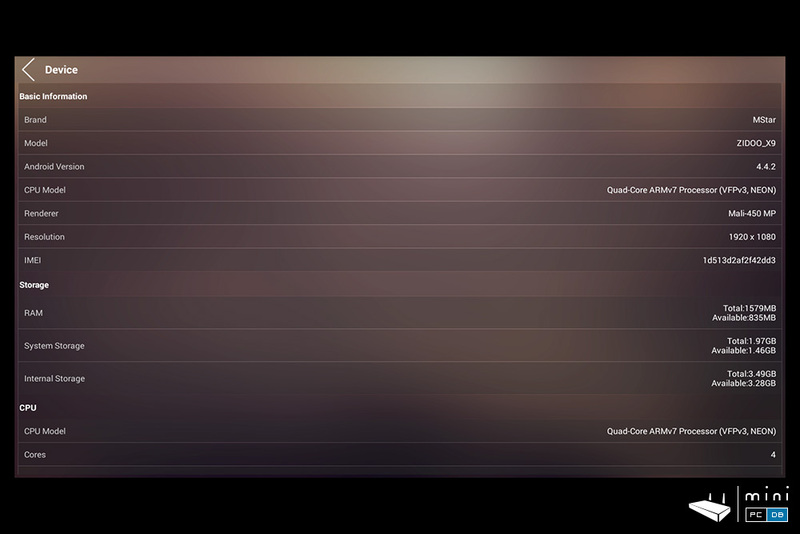 I haven't test it, but with a few router port redirects the Zidoo Nas features could be accessed from the internet, so you can add a torrent file on the download list from the office and have it ready by the time you get home. FTP Server - use the Zidoo's IP, the port is 2121, username "root" password "zidoo"
SSH Server - use the Zidoo's IP, the port is 22, username "root" password "zidoo"
Transmission, Aria2 - use http://Zidoo_IP:9091, and http://Zidoo_IP::18888/aria2. In conclusion, the Zidoo NAS kit is a nice feature. 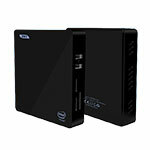 It would have been even more useful if Zidoo X9 had an internal HDD port (or external SATA), but you can connect a HDD enclosure (single or dual bay). 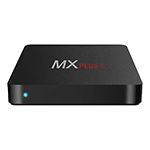 Uncommon among Android Mini PC's, HDMI recording is one of the best features of this device. 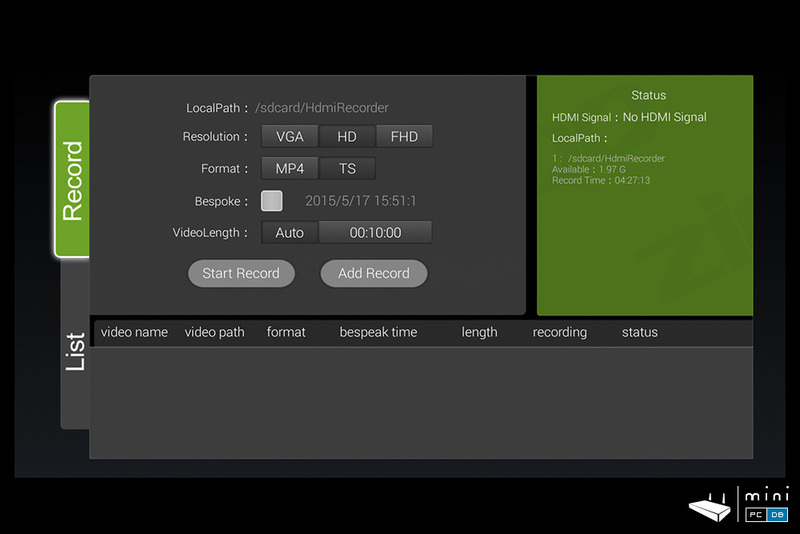 Once you connect a stick or HDD on USB the device will create a directory called "HdmiRecorder" automatically. 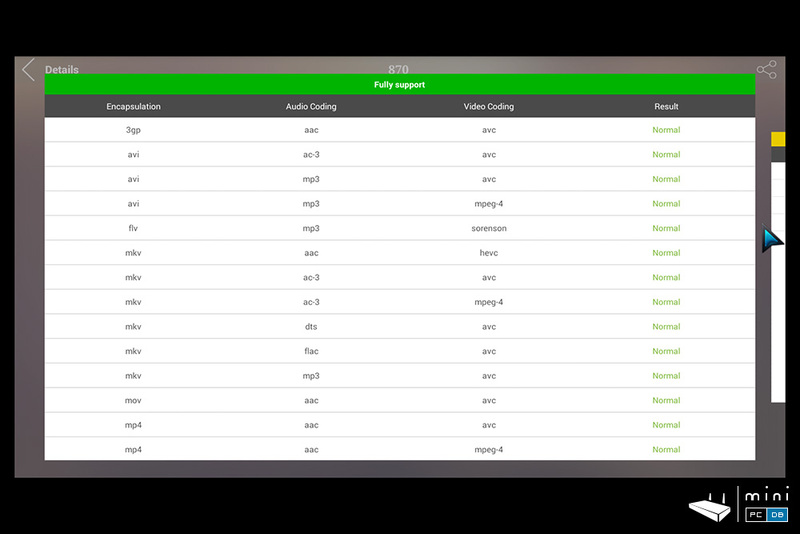 From the HDMI IN App you can select the video quality (VGA, HD, Full HD) and format (MP4, TS) and optionally you can schedule it ("bespoke"). The recorded video quality is not always perfect, but similar to the original. 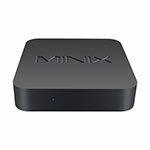 We'll be using this device to record from other Mini PC's that will be tested soon, so there will be soon videos posted here on MiniPCDB. Zidoo X9 has been on the market for a while, most inherent bugs have been fixed since the product was launched and Zidoo proved themselves to be trustworthy by providing regular firmware updates and sometimes they even listened to their users' feedback. Not only the software has improved over time, the product got now better benchmark scores than a few months ago. Zidoo X9's price decreased over the last few months and at the current $100 price tag does offer good value for the money. The product is well designed and gets the best out of the SoC used, as you get all of the current "bells and whistles" and you also have access to features that are either rare in the Android world (like HDMI-in PVR) or reserved to products that are more expensive (custom UI, custom apps). Zidoo X9 doesn't have a shutdown menu (or a stand-by option) - when you press the shutdown button the device gets powered off almost instantly. Zidoo promised that a shutdown menu will be added on a future update. 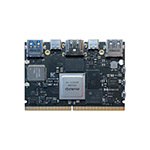 while excellent for normal use, the Zidoo X9 does not have the muscle required for heavy gaming or high bitrate, 4K HEVC, video rendering. 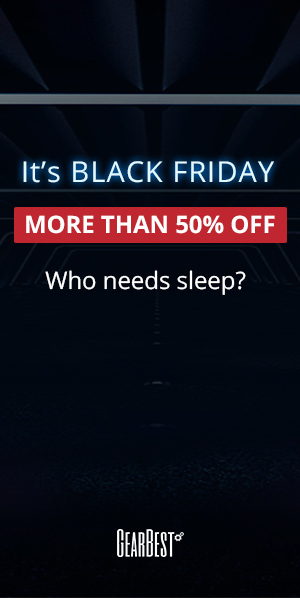 But in that price range, it doesn't have to.